April 10, 2003 - Ricky has hair again! It's been about 6 months since he could feel it on his own head. The crewcut adds something powerful to the scowl he now offers to someone asking for the telephone back. Never mind it's really ringing, if he's on the phone, you'll have to wait your turn. He's developed a special affinity for the telephone these days. It's unclear whether he's pretending to be Mom or Dad as he babbles away. The consensus at home is that he's pretending to be Mom talking to Dad, because it sounds like he's scolding his imaginary caller. March 12, 2003 - The very gates used to corral his big sisters are now deployed for Ricky. Climbing the stairs and then sliding down on his belly is now a favorite game. The gates also help Nana babysit because she tires easily following him from room to room. Now she can lock him in the living room with her. When those gates were packed up in the attic three years ago, we knew that we would be blessed to need them a third time. The fact Ricky is well enough that we need them again is another blessing for which we remain thankful. March 8, 2003 - The results of Ricky's MRI scan on the fifth of March are negative. We thank God there is no indication of any tumor re-growth. His next MRI is scheduled for April 16. Shhhhh! I'm on the phone. of Ricky's next MRI to May 21. May 23, 2003 - All clear on the MRI! We've also learned that Ricky's immune functions are normal, so we can schedule him for surgery to remove the Broviac from his chest. That means Ricky will be able play in the pool this summer at Auntie's house with his new cousin, Abigail Christina Pierro. They met for the first time at the end of April. She was born April 8, 2003. He's gaining weight, running, climbing and having conversations. Thank God! 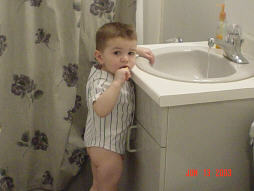 April 30, 2003 - We moved up Ricky's MRI due to our concern that he's again developing laziness in his left eye. Mom and Grandma have noticed it occassionally. 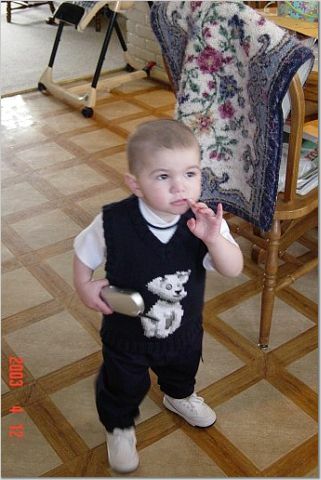 June 11, 2003 - We took Ricky for neuropsychological examination at Columbia Presbyterian Hospital. The purpose was to evaluate him for deficiencies caused by his illness or treatments. We saw Dr. Sands who has worked with Drs. Finlay and Gardner of NYU for over 5 years. Based on this experience with medulloblastoma patients, he emphasized that Ricky is doing very well! Hearing this from someone that's seen many kids with his diagnosis was very comforting because it tells us we're not just looking rose colored glasses. The next MRI is scheduled for June 25. June 25, 2003 - An upper respitory infection caused postponement of Ricky's MRI. It's been rescheduled for July 23. June 7, 2003 - H A P P Y B I R T H D A Y R I C K Y ! ! ! Two years old and full of life. Rain postponed our birthday plans, but BeeBee and Nana were on hand to enjoy Ricky's favorite meal, deep dish pizza. We cherish every moment with him. Hearing him sing Happy Birthday was the highlight of our day. For Ricky, he seemed to enjoy watching the candles burn more than blowing them out. For Mom and Dad, it was hard to put on a happy face. The sense of foreboding is always there. You can live for today, but you can't stop thinking about tomorrow. Grateful we shall remain, but some moments can be bittersweet. May God continue to bless you Ricky and bring you many, many more birthday parties, pizza and gifts. 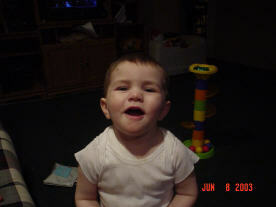 July 25, 2003 - ALL CLEAR ON THE MRI !!!! Ricky's latest scan was normal and we thank God and the hundreds of people that continue to pray for him. Special thanks to BeeBee and Nana for letting Mom and Dad get away for a few days. We are forever grateful for your continued support.